1. Prepare a martini glass by dipping the rim into the melted chocolate and leaving in the fridge to chill until it sets. Pour the mango and passion fruit coulis into the mould and freeze until it becomes solid. 2. To make the cocktail, pour all the ingredients into a cocktail shaker, fill with ice and shake for around 10 seconds until chilled. Strain the liquid into a glass, then pour back into the shaker and strain again into the chilled martini glass. 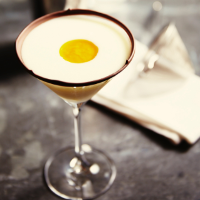 To serve, remove the egg-shaped frozen coulis and float it in the centre of the drink.